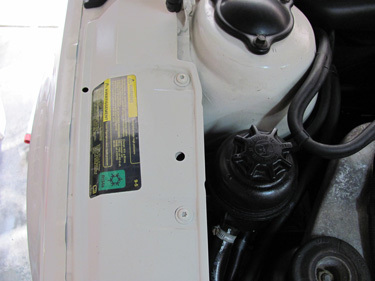 When dropping the subframe you will be removing the rear engine mount and the front torque mount. There will still be two engine mounts holding things up, however I do not think it is worth the risk for the minimal amount of time and money required to build the engine support. 7. 2 - 2" grade 8 bolt with washers and nuts to connect the eye bolt and engine together. The first step to building the rig is to locate the two end pieces. 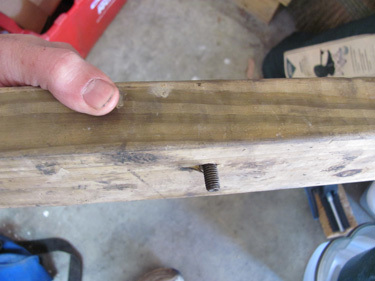 There is a hole on the fender where the M8 bolts can fit and hold the wood piece in place. Using a 1 foot length of 2x4, drill a hole for bolt and then oversized the top the so the head can sit flush. 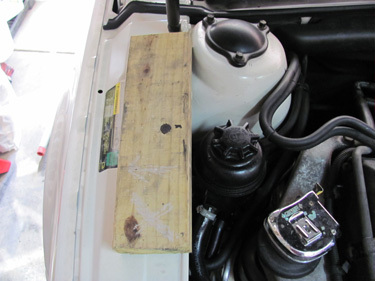 In order for the 4x4 post to clear the engine you have to add another 2x4 to the end pieces. This will also hold the bolt in place. The order of this process is key! You must first attach the 2nd layer 2x4 to the 4x4 post. 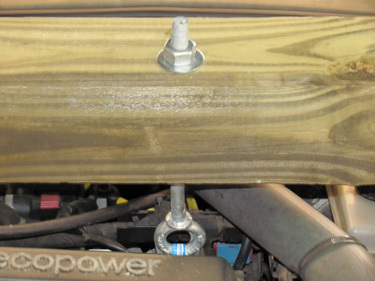 And then you can screw down the 2nd 2x4 to the fender piece. You have to do it in this order unless you have super long wood screws that can go through the 4x4 and into the 2x4s. 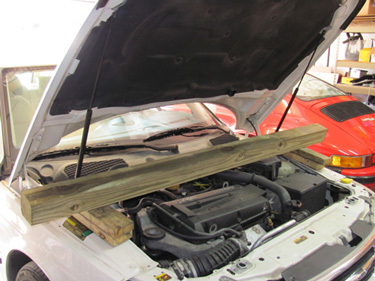 To make life easier, I layed everything on the car and then screwed the 2x4 into the 4x4 post one side at a time. I then applied some wood glue and screwed both 2x4s together. Once the end pieces are fixed, you can use a hand saw or power tool to cut the ends of 4x4 to the right length. The final step is to drill a hole for the eye bolt and hook up the rig to the engine. I had a long enough eye bolt that I only needed a massive bolt to connect the two together. 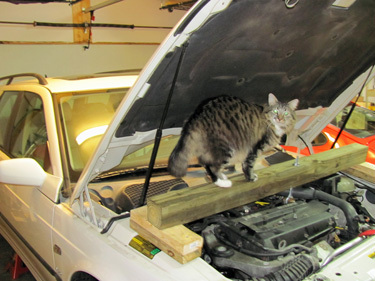 Now just tighten the nut for the eyebolt until you feel it is holding the engine.